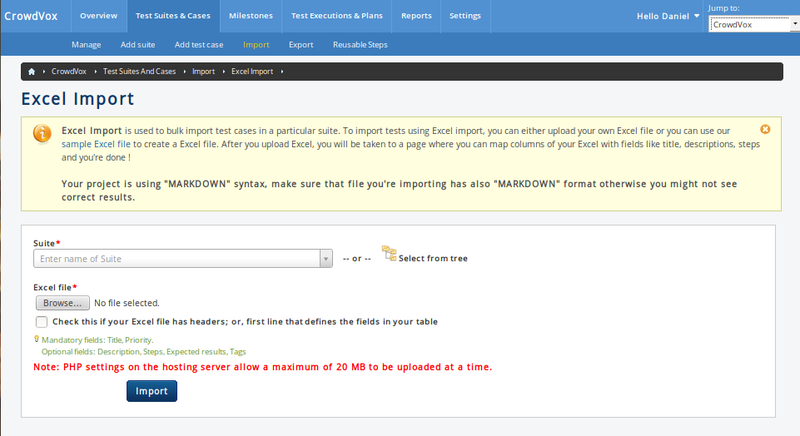 Test Collab users can import the test cases data into a project under a test suite using a Excel Spreadsheet and CSV. This helps in creating reusable cases, and saves creation and management time for cases that have already been defined. The spreadsheet to be used for importing the cases must follow a structure and some basic rules that are also related to test case creation. 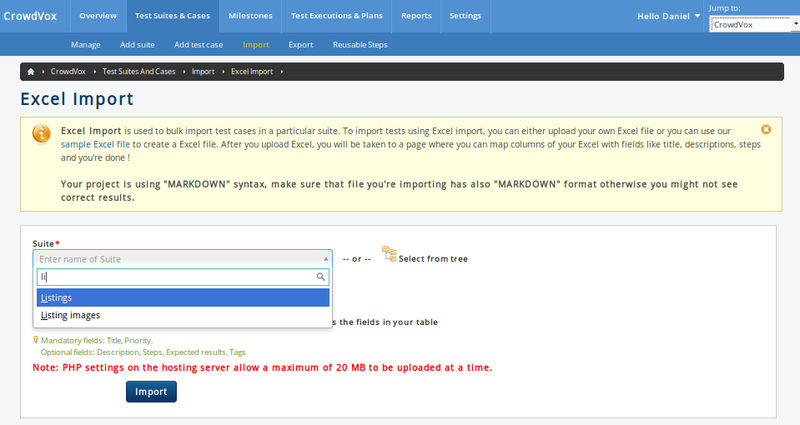 First of all make sure that the file you are using for import has the same syntax (Markdown / HTML / Plain text) as the one being used for your Test Collab's instance. Secondly check the size of file that is being uploaded, as the upload limit depends on the PHP settings done on your hosting server. As they are all part of a test case defined in the application. Off these, only Title and Priority are mandatory. To separate 2 steps under steps column leave a gap of a line between them. Both sample Excel files can be referred to create test cases that can then be imported into the application. A test suite selector lists the test suites that exist under the selected project, typing in the suites' selector box shows up the names of suites that match the criteria entered. As an option one can also click on the "Select from tree" icon, this will show up the suites' list to select suites from the tree. User will be required to select the suite for which he wants the cases to be imported. Empty suites will also appear in the list, to enable the user to import data for them. Once suite is selected and file to upload has been chosen, user can proceed by clicking import button. Next screen will allow the user to select the field used in Test Collab individually that maps to a spreadsheet column (name shown as label for drop down). When all mandatory fields (for a test case) have been mapped, then a process to merge the data from spreadsheet into the test suite will start. If there are any issues while import then the same will be reported on screen. 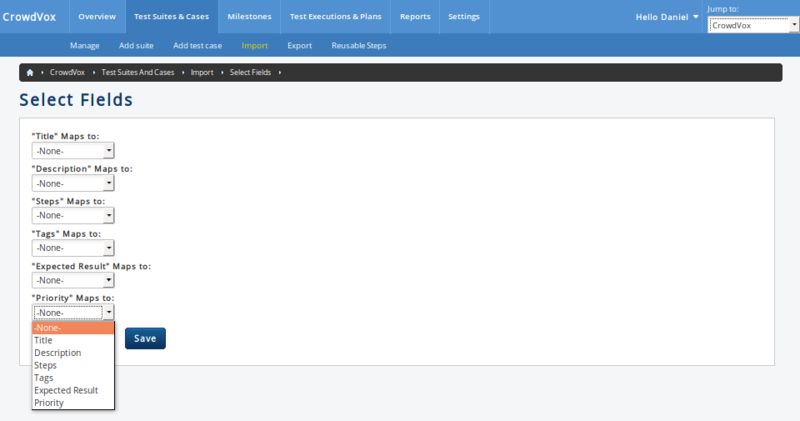 Please note that all the test cases present in spreadsheet used will be imported under a single (selected) test suite.